Missing any teeth? It can be a huge problem for many patients. It isn’t just an appearance issue that these patients have to deal with, it’s functionality, too. Think about it: when you have missing teeth, you can’t perform many no-brainer functions. These functions include eating, speaking, biting, sneezing and more. In addition, open spaces in your mouth can invite bacteria and other diseases into your mouth. Your teeth are very important and keeping them takes dedication and coming to our office in Houston, TX. Sometimes, there’s nothing anyone can do about missing teeth…until now. 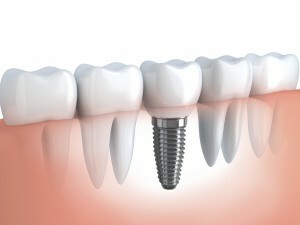 If you haven’t heard of dental implants, they’re the perfect resolution to missing teeth. They provide therapy for those that have missing teeth. They surely wonder what life would be like if they didn’t have to deal with any missing teeth. Luckily, dental implants provide the stability and functionality of natural teeth and look good, too! Why Are My Teeth Missing? No matter the reason, it’s important to take care of the problem and quickly. The longer you put off replacing your missing teeth, the quicker you can develop a disease, or even worse, an infection. Teeth-In-An-Hour treatment is here to help. It does exactly what its name says. It’s a step above regular dental implants in that healing time is eradicated. There’s less discomfort, swelling and bruising. All are experienced when you choose regular dental implants, but Teeth-In-An-Hour can be better for your particular situation. If you’re not a fan of the problems that are associated with healing, Teeth-In-An-Hour may be the best choice for you. We don’t want you to suffer with missing teeth any longer than you already have. Your life will go back to normal and you can enjoy enjoying your favorite foods minus discomfort or pain. Not only that, when you smile you’ll notice a distinct lack of open space. Both regular dental implants and Teeth-In-An-Hour offer the relief you need from missing teeth. Don’t suffer a day longer and make an appointment at our Houston, TX office. by: Dr. Steve Koo at August 28, 2015 .